A brief magisterial introduction to the conservative tradition by one of Britain’s leading intellectuals. 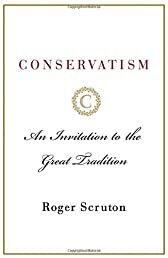 In Conservatism, Roger Scruton offers the reader an invitation into the world of political philosophy by explaining the history and evolution of the conservative movement over the centuries. With the clarity and authority of a gifted teacher, he discusses the ideology's perspective on civil society, the rule of law, freedom, morality, property, rights, and the role of the state. In a time when many claim that conservatives lack a unified intellectual belief system, this book makes a very strong case to the contrary, one that politically-minded readers will find compelling and refreshing. Suicide of the West: How the Rebirth of Tribalism, Populism, Nationalism, and Identity Politics is Des..